First flying reptile discovered in British Columbia was for years forgotten in a cabinet. Stashed away in a University of Alberta cabinet as an unidentified fossil oddity, the jawbone of the first pterosaur to be found in British Columbia was unrecognized until a young paleontologist examined its peculiar rows of piranha-like teeth. When Victoria Arbour was studying the fossil, the only creature she could find that had a similar crowded, arrow teeth was a Chinese pterosaur. But a prehistoric flying reptile like that had never been found in British Columbia, so she realized that it must be a new species. In 2011, she published her discovery with Philip J. Currie in the January issue of Canadian Journal of Earth Sciences. The new pterosaur’s name, “Gwawinapterus beardi,” reflects its Canadian origins. Taking its beginning from “Gwa’wina,” meaning raven in Kwak’wala, it references the language of the Kwakwaka’wakw people of Hornby Island in British Columbia. “Pteron” is Greek for wing, and “beardi” is a tribute to Graham Beard who originally found the bone inside a rock picked up from the Hornby Island beach. 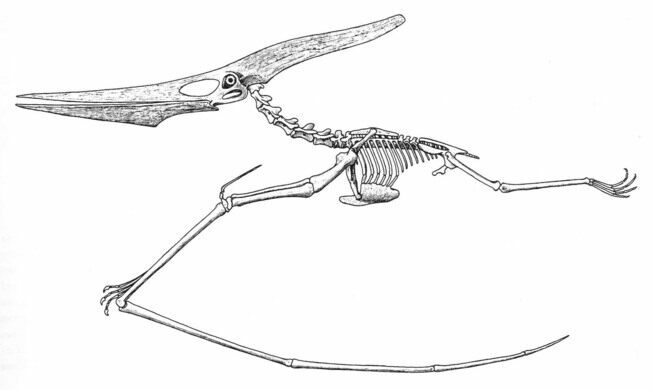 Gwawinapterus beardi is only the second pterosaur ever found in Canada. It flew over forests that, 70 million years ago when Hornby Island was located where California is now, were much warmer and tropical that present day British Columbia. The pterosaur was a little like a flying, reptilian giraffe, with a huge head on a long neck with a short body. It’s estimated that the Cretaceous reptile soared on a wingspan of three meters and used its many pointy teeth to gnaw on scavenged flesh. The New Central Library is a masterpiece of contemporary architecture in the midst of downtown Calgary.